SpaceVim is a community-driven modular Vim distribution. It manages collections of plugins in layers, which help to collect related packages together to provide IDE-like features. SpaceVim is not just a vimrc but an ultimate Vim configuration, It contains many built-in features. The last release is v1.0.0, check out following-HEAD page for what happened since last release. If you have any questions about SpaceVim, please follow the Getting Help Guide. # This is basic configuration example for SpaceVim. # All SpaceVim options below [options] snippet. # Set SpaceVim theme. By default colorscheme layer is not loaded. SpaceVim uses a powerful iedit mode to quick edit multiple occurrences of a symbol or selection. Two new modes:iedit-Normal/iedit-Insert. The default color for iedit is red/green which is based on the current colorscheme. SpaceVim supports highlighting of the current symbol on demand and adds a transient state to easily navigate and rename this symbol. 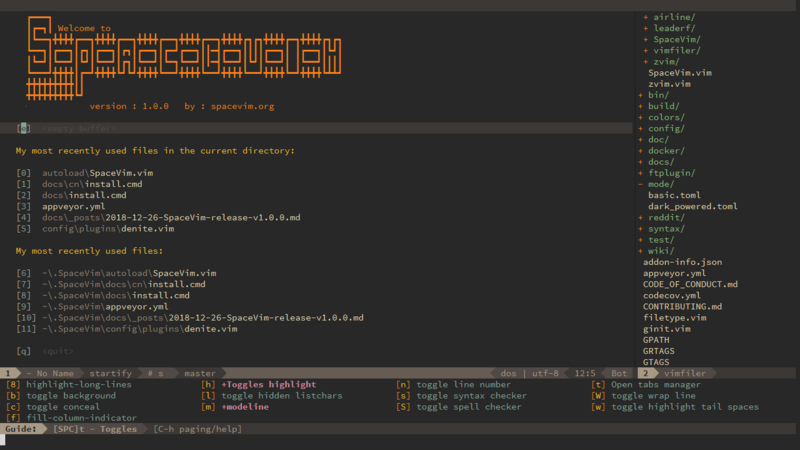 With this feature, Vim will display the searching result as you type. Of course, it is running asynchronously. Before using this feature, you need to install a searching tool. FlyGrep works through search tools: ag, rg, ack, pt and grep, Choose one you like. You don't need to remember any key bindings, as the mapping guide will show up after the SPC is pressed. The mapping guide is also available for g, z, and s.
Use SPC h d k to get the help description of a key binding, and gd to find definition of key bindings. The best way to support SpaceVim is to contribute to it either by reporting bugs. Helping the community on the Gitter Chat or sending pull requests. For more information please check our development guidelines. If you want to show your support financially you can buy a drink for the maintainer by clicking following icon. Authors of all the plugins used in SpaceVim.